Laura Juillet joined LALIVE in 2018 as its HR Manager. Before joining the firm, Laura practiced for several years as a UK solicitor, specialising in employment law, and worked as the Office Manager for the Geneva office of two leading US firms, where she was responsible for local HR, operations and administration. 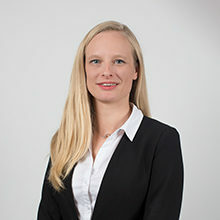 Laura holds an LLB in Law and French Law from University College London and a Postgraduate Diploma in Legal Practice (LPC) from Nottingham Law School. She speaks English and French.